And there you have it. Enjoy, comments and constructive criticism are welcome, as always! Now that's very good. Simple, but cool-looking and aerodynamic. And cute. I really like the overall shape (especially at the rear) and structure. Really neat, and surprisingly sleek for an alternative creation. The colours don't look bad at all, either. The plugging-hole is also a very nice detail. The only thing that pokes my eye is the 1x2 plate with one stud at the nose; its sharp edges don't really fit with the otherwise so round and sleek look of the speeder. How bad would it look with only one saber handle and no plate? Cool, sleek and simple. Nice work. 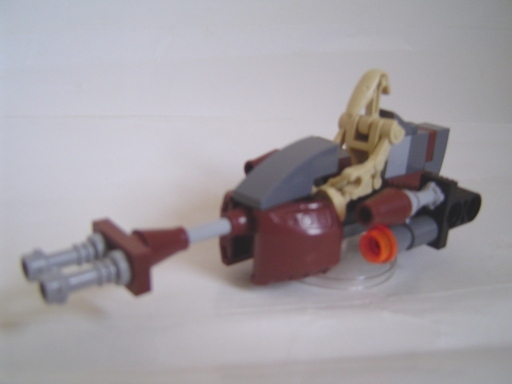 Could you find a reference pic for the speeder it's based off? And I actually think the front with the 1x2 plate looks okay. The only thing I would suggest is making the grey bar longer, if possible. Galagoo: Cute indeed, but not so simple, I used up all 4 of the studs on the sides bricks and the travis. The plugginf hole was a late addition, and the front was originally covered by the 3rd 2x2 slopey thing, to give me room to add the 2x1 plate with the handle on it, so that the droid could pilot it. It didn't fit well, so I had to resort to this method. With regards to your dislike of the steering vanes, I realise that tjhis method is blocky, but I wanted to simulate the appearance of twin vanes, and not just one. Due to the slim profile of the speeder, and to some extend the limited piece selection, I was forced to make do like this. This is pretty cool little model. It's original, clean, and works well with the droid minifig. I also like this because it makes good use of the smaller pieces that would be left over if someone used all the bigger pieces as part of a ship or something. Thanks turtle, you're right. This is just a little tablescrap, and if I had the pieces to build summat bigger, like a base, this would be a nice accompaniement. Heh, that's pretty nifty! I love how you've quite inventively used the unusual pieces to your advantage. My main beef is with the nose, but knowing how you had very limited pieces I salute you.